Among Vee Vee’s charms are its boldly colored walls (Benjamin Moore’s “Autumn Cover”), a signature touch for co-owner Kristen Valachovic, an interior designer before restaurant life took hold. Vee Vee is a neighborhood bistro people return to because it’s comfortable--but surprising. The venue is cozy, with a dash of the sultry: walls are persimmon orange against dark chocolate-colored wainscoting. Monstera in oversized glass vases hang gracefully by a very small bar that offers well-selected wines and microbrewed beers. The work of fine local artists is on display. The casual atmosphere attracts a diverse crowd, from dating couples to folks who bring their babies to an early dinner. What’s special is that the modestly priced Vee Vee also turns out innovative food that is fresh and healthy. 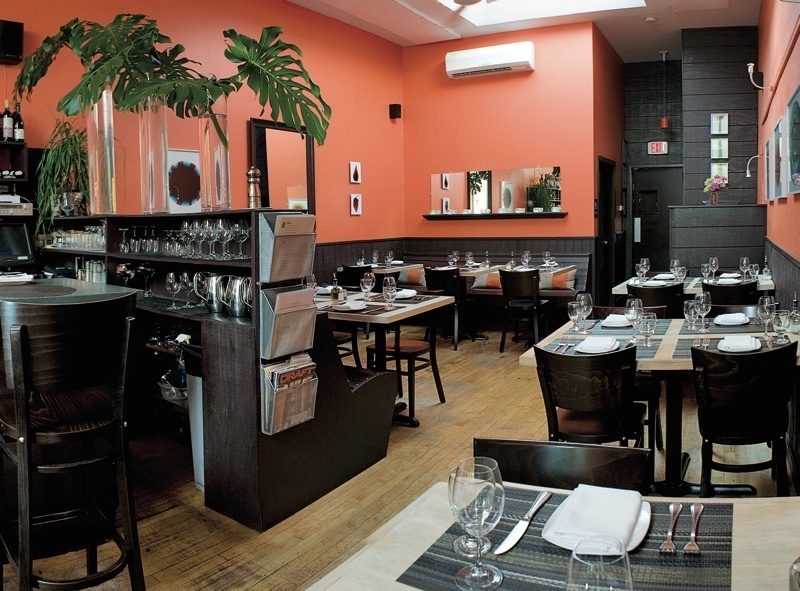 Why can’t more restaurants satisfy this triumvirate of desires in a stylish milieu? Don’t be discouraged by the small menu. Everything tastes good. Chef Seth Amsden plays with an array of textures and emphasizes locally grown produce. Vegetarian fare abounds. The night we were there, five of the seven appetizers had neither meat nor fish and there was no beef or chicken among the entrées. To start, we had the delectable shrimp and scallop cake with chipotle aioli ($8), which was, thankfully, free of the surplus breading that ruins many an item like this. The crisp morsels of seafood were just juicy enough and spiced just right, and accompanied by a few spoonfuls of chopped red onion, tomatoes, and parsley in a light vinaigrette. Noting the peach and purslane salad ($9) on the menu, we pictured succulent just-ripe wedges atop a bit of crunchy stuff. The textured contrast was interesting, but the proportions were reversed, leading to a bit too much cow-like munching on the grassy weeds, with only a few peachy bites as relief. The mushroom ragout entrée was a tangle of thinly sliced crimini, maitake, and oyster mushrooms ($17) that came, carefully salted, in a miniature frying pan over chewy pellets of farro. A handful of fava beans added a playful color and softer bite. The egg, cooked sunny side up and topped with shards of aged cheese, made the dish cohere, while the accompanying arugula salad was a welcome, sharp contrast. We also loved the Southwestern-style tofu dish ($14). It featured a bed of thick, smoky black beans (worth eating all alone), teamed with a cold avocado, onion, and mango salsa. The tofu’s texture was like chicken and the molé crust gave it a surprising kick. Delicious, too, were slabs of roasted sweet potato in their crackling skins. Vee Vee’s desserts can be a rich reward for eating right. The Polynesian vanilla bean pot au crème ($7) was served with perfectly rendered chocolate sablés (round French butter cookies), and we savored the novel pairing of chocolate brioche pudding (milky, loosely packed slabs of bread with molten chocolate) with brandied figs ($7). When they opened their restaurant in 2008, owners Daniel and Kristen Valachovic (whence Vee Vee) envisioned a truly local haunt with startlingly good food. They host various community events, fundraisers, and specialty food nights. If the people lined up for Thursdays’ $1 oysters (until 7 p.m. only!) are any indication, they have succeeded.